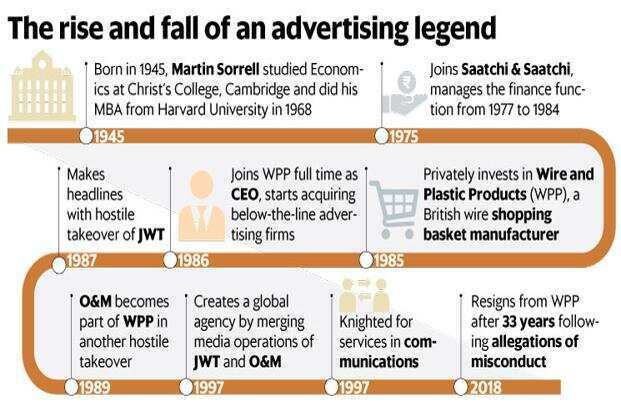 New Delhi: Martin Sorrell on Sunday quit as chief executive of WPP Plc, 33 years after founding the world’s largest communications services group. The move follows news of an investigation launched by the WPP board earlier this month into allegations of personal misconduct and misuse of company assets by Sorrell. “The previously announced investigation into an allegation of misconduct against Sir Martin has concluded. The allegation did not involve amounts that are material," read a statement from the firm. The 73-year-old British businessman is one of the most well-known figures in the advertising industry. He is particularly known for his aggressive acquisition style, sharp business acumen and driving growth. “Obviously, I am sad to leave WPP after 33 years. It has been a passion, focus and source of energy for so long. However, I believe it is in the best interests of the business if I step down now," Sorrell said in a statement. He further added that he is leaving the company in very good hands, and that the board knows it. “Mark (Read) and Andrew (Scott) and the management team at all levels have the knowledge and abilities to take WPP to even greater heights and capitalise on the geographic and functional opportunities. I will particularly miss the daily interactions with everyone across the world and want to thank them and their families for all they have done, and will do, for WPP," the statement read. Roberto Quarta, chairman of WPP, becomes executive chairman until the appointment of a new chief executive. Mark Read, chief executive of digital agency Wunderman and WPP Digital, and Andrew Scott, WPP’s corporate development director and chief operating officer for Europe, have been appointed as joint chief operating officers. Sorrell’s exit could affect WPP which had revenue of more than $19 billion last year, but has lost a third of its market value over the past 12 months. Like all big agencies, WPP has also been facing growth issues as clients trim spending, and tech companies like Google (Alphabet Inc.) and Facebook Inc. increasingly corner marketing budgets. Ashish Bhasin, chairman and chief executive (South Asia) at Dentsu Aegis Networks, said whenever a leader of such a stature leaves, there is change. “It could be a positive change if handled well or it could be unsettling. It’s an internal matter of WPP on which I would not like to comment and only time will tell which way things shape up." Aditya Birla Capital’s chief marketing officer Ajay Kakar, who has had a 27-year-long association with WPP, first as an employee at Ogilvy and later as a client, said Sorrell created many firsts in the industry including new streams of communication (PR, digital and direct), made talent and training two unifying factors across the diverse WPP Group and created the role of country manager. “Sir Martin had an aura and reputation that was far larger than the man’s physical stature, bordering on fear. While it may be routine today, he first created special WPP structures for clients like HSBC, with the best of talent from across WPP, brought under one team. He was always accessible, gave instant response and took quick decisions. More than anything else, he loved India and admired WPP’s operations in India," he added. Pratap Bose, founding partner and chairman at marketing communications agency The Social Street, who has worked closely with Sorrell for many years during his stint at Ogilvy, said he is a great deal maker who made massive pitches, acquisitions and transformed WPP into a powerhouse. “He would travel frequently across regions to understand the business opportunities and no matter which part of the world he was in, he would reply to mails/messages within 15 minutes. He has an elephantine memory and an unmatched passion for WPP. He/She will have huge boots to fill. Everything said and done, I believe there won’t be another Martin for sure," he added.